Hydraulic conductivity (K), a parameter that describes the ease with which water flows in the subsurface, is widely regarded as one of the most important hydrogeologic parameters for environmental site investigations. Mathematically, it is defined as the flowrate per unit area divided by the hydraulic gradient in the direction of flow. Traditional methods for in situ measurement of K include pumping tests and slug tests. More recent work has focused on measuring spatial variations in K and the impact of these variations on the fate and transport of contaminants and on the effectiveness of remediation systems. CONTRIBUTOR(S): Dr. Gaisheng Liu and Dr. James Butler, Jr. Figure 1. Schematic of Darcy’s Law flow experiment. L is the total length. μ is the dynamic viscosity of the pore water. indirect methods that rely on empirical correlations, often site-specific in nature, between K and other more readily evaluated formation properties (e.g., resistance to electric current). Because hydraulic methods can be directly related to the mathematical definition of K through Darcy’s Law, K estimates obtained with those methods are generally considered to be more reliable than those obtained with indirect methods. Other classifications of K characterization approaches are possible. For example, approaches can be divided into those based on data collected in the field and those based on measurements on core samples in the laboratory. In the latter case, there can be considerable uncertainty about how representative the core sample is of field conditions. Field-based approaches can be further subdivided based on whether the measurement is conducted in the subsurface or on the surface. Subsurface measurements provide the most reliable information about K variations at the scale needed for environmental site investigations. Nearly all field-based hydraulic methods are performed in the subsurface and require either boreholes or direct push (DP) installations for extracting or injecting water and monitoring the induced head changes. Compared to methods that rely on existing wells, DP approaches can be applied essentially wherever K information is needed, thus greatly expanding the spatial coverage of K measurement in the field. DP approaches, however, are generally limited to use in relatively shallow (20-30 m from land surface) unconsolidated settings. Field K measurements can also be performed on the land surface or in an aircraft. Most of these are geophysical approaches that involve measuring electrical, magnetic, or seismic properties of the formation and then transforming them into K estimates using empirical relations. The biggest advantage of surface or airborne approaches is their minimal site disturbance, as no subsurface boring is needed. However, the resolution that can be provided is limited, as the measurements are typically affected by conditions over a relatively large volume of the formation. Geophysical methods can also be performed in boreholes. Borehole geophysical methods can provide a much higher resolution description of K than surface-based methods. The scale of measurement is an important factor to consider when assessing various approaches. 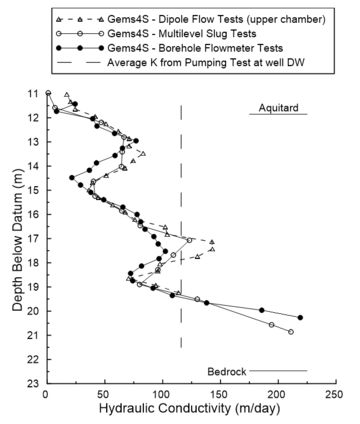 For water-supply investigations, a single estimate of K averaged over a large volume of an aquifer will usually suffice; such an estimate is commonly obtained via pumping tests in a well. For water-quality investigations, however, K estimates over a large measurement volume are often of limited value. In that case, small-scale K measurements that provide information about local geological controls on groundwater flow and transport are usually required to obtain reliable predictions of contaminant behavior and to design effective remediation systems. In this article, we focus on the approaches that can be used to obtain small-scale, localized measurements of K for environmental site investigations. Only the more commonly used approaches are discussed. Some other approaches, such as dipole flow tests, tracer tests, or hydraulic tomography will not be discussed here. The pumping test is the most common method for determining K over a relatively large volume of an aquifer in water-supply investigations. During a typical test, the pumping rate is kept constant, although it can be varied in time to obtain better signal-to-noise ratios in the acquired data. In the constant-rate approach, a well, preferably centrally located at the site, is pumped while induced head changes are monitored at that and nearby wells. The head changes, along with the pumping rate, can then be used to estimate aquifer parameters using different models of the well-aquifer configuration. Pumping test analyses can be facilitated using software packages like AQTESOLV (Aquifer Test Solver), which has been developed for analyzing different types of aquifer tests. Pumping tests are primarily performed to obtain large-scale volumetric averages of aquifer parameters as well as information about aquifer boundaries. However, one form of the pumping test, the step-drawdown test, is specifically directed at getting information about the efficiency of the pumping well. The K estimate from a pumping test is an average over a large volume of the formation and does not provide information at the scale of most relevance for issues involving contaminant transport (e.g., meters or less). Thus, pumping tests are less commonly employed for environmental site investigations. Figure 2A. Schematic of a Falling-Head Slug Test (water flows from well into aquifer) Performed in a Multi-Level Slug-Test System. 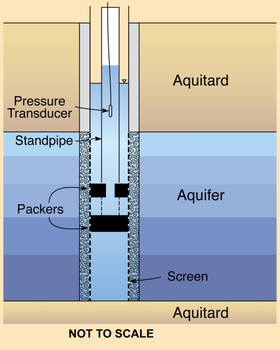 Head change is introduced in standpipe, which is directly connected to the interval isolated by the straddle packers (not to scale). Figure 2B. Example Data plot from a Multilevel Slug Test at GEMS. Test is initiated by sudden depressurization of a pressurized air column. The slug test is one of the most common methods for determining K at the scale of relevance for environmental site investigations. Slug tests are typically performed in existing wells at multiple horizontal and vertical locations across the site to characterize the spatial distribution of K values. However, slug tests can also be performed in temporary installations such as DP rods. In this approach, a near-instantaneous head change is applied in the well or DP rods and the subsequent head recovery is used to estimate K. The initial head change can be introduced using a solid object (slug), compressed gas (pneumatic system), or by the addition/removal of a certain amount of water. The recovery data can be analyzed using different models of the well-formation configuration. In contrast to pumping tests, slug tests provide a K estimate that is primarily a function of the materials in the vicinity of the screened interval of the test well. Slug test data analyses can be facilitated using software packages like AQTESOLV (Aquifer Test Solver), which has been developed for analyzing different test methods. Although a slug test is very simple in principle, considerable care must be taken in all stages of a test. Because test responses are highly sensitive to the materials immediately adjacent to the test well, that well must be appropriately developed before a test is performed. Otherwise, the K estimate can be biased by a low-K zone (skin) that can form during well construction. In high-K formations, the head recovery is rapid, and pneumatic methods are often used to minimize the time associated with test initiation. 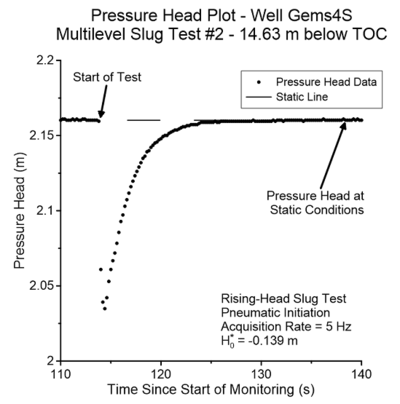 In addition, due to the relatively high flow velocity, the impact of pipe hydraulics on pressure readings should be considered when analyzing slug test data from high-K zones. In low-K formations, slug tests can take an extremely long time to complete, although test time can be significantly reduced by decreasing the effective casing radius (portion of well in which the water level is changing). Slug tests can be configured to obtain information about vertical variations in K along the screened (open) interval of a well. Test intervals can be isolated with straddle packers, and slug tests performed within that isolated interval. The straddle packers can be incrementally moved along the screened interval of a well to characterize the vertical variation of K at a relatively high resolution. Using a two-packer tool (Fig. 2A), slug tests have been performed in a number of 0.25-m intervals in a well at the Geohydrologic Experimental and Monitoring Site (GEMS) in the Kansas River valley. At each isolated interval, multiple tests are performed, initiated with different head changes, following recommended test guidelines. An example data set is presented in Figure 2B. The multi-level slug test K estimates compare favorably with estimates obtained using other approaches (Fig. 3). Figure 3. K Estimates from Different Field Methods at GEMS. Well DW is located 2 m east of GEMS4S. Figure 4. Schematic Illustrating Hydrostratigraphic Profiling, the combination of electrical conductivity (EC) and multilevel slug test profiling. In addition to existing wells, slug tests can also be performed in DP installations so that K estimates can be obtained virtually at any location in unconsolidated formations. Various approaches have been developed that allow slug tests to be performed at one or multiple levels in a single DP hole. In McCall et al. (2002), a pair of nested rod strings were driven to the test interval with a solid drive point attached to the end of inner rod string for advancement. Upon reaching the test depth, the drive point and inner rod string were retracted, and a screen was lowered to the bottom of the outer rod string. The outer rod string was pulled up while the screen was held in place, leaving the screen exposed to the surrounding formation. After the slug test was completed in the exposed screen, the screen was removed and the inner rod string with the attached solid drive point was reinserted. The nested rod strings were then driven to the next test depth. In low-K formations such as silts and clays, the formation materials may not collapse completely back to the screen when the outer rod string is pulled up. In this case, the diameter of the borehole can be estimated and used in place of the screen diameter, or the problem can be avoided by using a coring tube of similar size to the screen to create a hole below the end of the outer rod string. Instead of setting the screen by pulling up the outer rod string, the screen can be directly inserted into the hole for slug testing. Regardless of how the screen is set into the formation, it is always recommended that the screen be appropriately developed before slug tests are performed. In low-K formations, development may be limited to scraping the sides of the cored hole with a steel brush and removing the silty water from the screen with a low-flow pump. Sellwood et al. (2005) proposed a modification of the approach by McCall et al. (2002) to reduce profiling time and gain more information about subsurface stratigraphy. Instead of performing slug tests on the way down, slug tests were performed at different depths as the outer rod string was pulled up (Fig. 4). This way, the number of changes between the outer and inner rod strings was minimized (i.e., only one change needed at the bottom of the profile). Furthermore, an electrical conductivity (EC) probe was attached to the inner rod string so that EC data could be collected as the rod strings were advanced; the EC data could then be used for selecting the intervals for slug tests as the rod strings were retracted. This approach, called hydrostratigraphic profiling, enabled the collection of information on electrical and hydraulic conductivity to be obtained at a speed and resolution that had previously not been possible. Figure 5. Schematic Diagram showing the borehole Flowmeter Profiling Procedure. 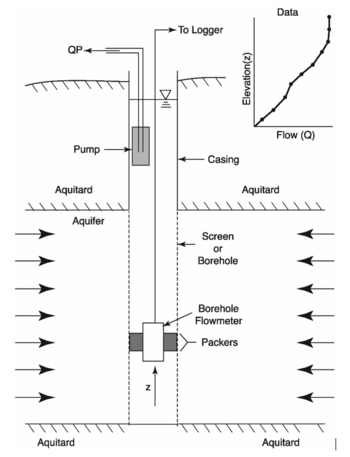 Borehole flowmeter profiling is one of the most efficient approaches for characterizing the vertical variations of K. This approach involves pumping a well at a constant rate while measuring the vertical flow rate within the screened interval (Fig. 5). A flowmeter is initially positioned at the bottom of the screen. After the pump is turned on and the pumping rate stabilizes, the flowmeter is gradually moved up, often in an incremental fashion with short stops, although continuous profiling is also done. After the entire screened interval is measured, the profile of vertical flow rates versus depths can be used for K estimation. Typically, two profiles are performed, one prior to pumping and one during pumping. The profile obtained during pumping is corrected with the profile prior to pumping to remove the impacts of ambient flow in the well. Due to the difficulty of detecting small differences in flow rates, the K estimates from flowmeter profiling are subject to more noise in less permeable settings. In addition, the results of flowmeter profiling are sensitive to in-well hydraulics, such as the impedance of flowmeter to vertical flow and disturbance by the pump intake when it is too close to the measurement interval. Different types of flowmeters have been used for borehole profiling. For example, electromagnetic flowmeters are often used in environmental site investigations due to their lower flow rate detection limit and lower head loss (high head loss across the flowmeter can cause flow bypass through the filter pack of the well). However, they may be more expensive than other options and have certain practical limitations as well. Heat pulse flowmeters are also used for profiling in less-permeable settings. Bt is the total thickness of the aquifer. Ka can be obtained from pumping or slug tests at the same well, although it is generally recommended that slug tests be used, as the average K in the immediate vicinity of the well may differ from that determined from a pumping test in a laterally heterogeneous aquifer. Figure 3 compares the results of borehole flowmeter profiling and multilevel slug tests at GEMS. Despite some local differences, the K estimates from borehole flowmeter profiling and multilevel slug tests are quite similar at that well. Figure 6A. Schematic of the DPIL with a Screen Attached to the Probe Rod at its Lower End. DP technology has shown great promise for characterization of K variations in shallow unconsolidated formations at the resolution, accuracy, and speed that are critically needed for practical investigations. 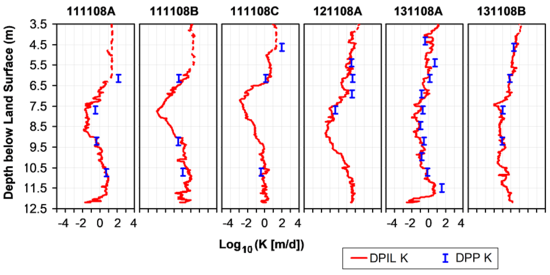 Over the last few decades, a series of DP methods and probes have been developed for obtaining information about vertical variations in K.
DP Injection Logging (DPIL) is one of the most powerful approaches for K characterization (in terms of resolution and speed of acquisition) and is also one of the most widely used techniques in environmental site investigations. This approach consists of advancing a probe with a single screened port (Fig. 6A). Water is injected continuously through the screen while the probe is advanced and the pressure response to injection is monitored behind the screen or at the surface. The profile of the ratio of injection rate to injection pressure is closely related to vertical variations in K. However, factors other than the hydraulic conductivity can potentially affect the pressure response (e.g., injection line losses, probe advancement speed, formation alteration, and variations in specific storage), so DPIL ratios only provide relative information about K variations. Methods are needed for transforming DPIL ratios into actual K estimates; these methods typically involve correlations with nearby K data. Figure 6B. Artistic Rendering of the HPT (continuous DPIL probe combined with an EC Wenner array) . use of multiple injection rates at each depth allows a better assessment of the formation response to injection. However, due to the need to halt advancement, discontinuous DPIL requires significantly more time than continuous DPIL, and, as a result, resolution below 10 - 20 cm is rarely possible. In common practice, continuous DPIL is generally preferred due to its speed (a 20-m profile requires about 2 hours) and resolution (one measurement per 1.5 cm vertical interval). A continuous DPIL probe, supplemented with an EC sensor, is commercially available from Geoprobe Systems under the tradename of the Hydraulic Profiling Tool (HPT; Fig. 6B). The HPT is most effective in moderately permeable formations with a K range of 0.03 to 10 m/d, although the detection range can be improved by modifying equipment and operating procedures. In standard HPT practice, the probe advancement rate is 2 cm/s and the continuous water injection rate is about 300 mL/min. 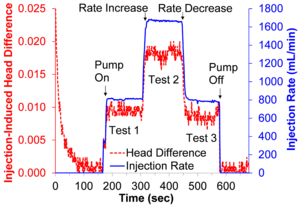 In high K formations (e.g., K > 10 m/d), the injection pressure response to the standard injection rate is generally too small to be reliably measured. A larger injection rate can be used to increase the pressure signal. 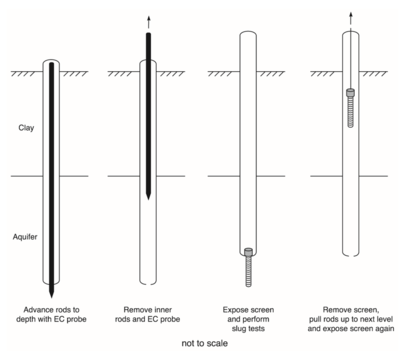 However, the line loss between the transducer and injection screen, which increases quadratically with the injection rate, may become significant and require additional step tests to remove its impact. On the other hand, in low K formations (e.g., K < 0.03 m/d), the pressure increase from probe advancement and water injection may become so large that it will cause formation alterations and exceed the upper measurement limit of the transducer. A recent study has demonstrated that by reducing both probe advancement speed and flow injection rate, HPT can be applied to formations with K as low as 0.003 m/d. Transforming DPIL profiles into K estimates is based on empirical relationships . Although a general relationship has been presented, site-specific calibrations are typically used to improve the reliability of K estimates. The site-specific calibrations can be performed by comparing the DPIL profiles to nearby K estimates obtained via other means or by a modeling approach that directly combines the DPIL data with collocated hydraulic tests such as seen in Figure 6C, which shows a series of K profiles from continuous DPIL as calibrated by collocated hydraulic tests at an alluvial aquifer in Mississippi. Figure 6C. Six Example DPIL (red curve) K Profiles Calibrated by Collocated Direct Push Permeameter Tests (blue bars) at the MacroDispersion Experiment (MADE) Site, Columbus, MS. The dashed curves represent the upper K limit for continuous DPIL under the given tool operating procedure. There are two major assumptions invoked for estimating K from DPIL profiles. First, near-rod material compaction from probe advancement has a similar impact on K at all depths of the profile. Second, the impact of formation specific storage is either similar across the profile or can be ignored. Both assumptions appear to be valid for sands and gravels. In silts and clays, particularly those with high compressibility, considerable caution must be used to assess the viability of these assumptions. Figure 7A. Schematic of the DPP (not to scale). Figure 7B. Example DPP Test Sequence at GEMS. Figure 8. Comparison of DPP and DP Multilevel Slug Test K profiles at GEMS. 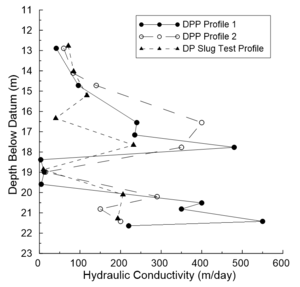 The slug test profile is located 2 m northwest of DPP profile 1, and 2 m southeast of DPP profile 2. 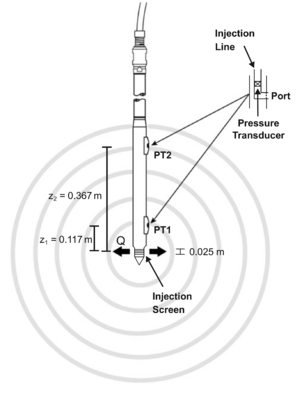 The Direct Push Permeameter (DPP) consists of a short cylindrical screen with two pressure transducers inset into the probe at short distances above the screen (Fig. 7A). The DPP probe is advanced to a depth at which a K estimate is needed and then a series of short-term injection tests are performed. K is then typically estimated from the spherical form of Darcy’s Law using the injection rate and the injection-induced pressure responses at the two transducers. The resulting estimate is a weighted average over the interval (approx. 0.4 m in Fig. 7A) between the screen and the farthest transducer; material outside of that interval has little influence . Horizontally, the DPP shows little sensitivity to conditions greater than ∼ 0.5 m away from the tool. The DPP test procedure only requires that steady-shape (constant hydraulic gradient) flow conditions be attained. True steady-state conditions are not required, which can lead to a significant reduction in the measurement time. A DPP test sequence generally requires 10 – 15 minutes per measurement interval in moderate to high-K formations. Figure 7B shows an example DPP test sequence at GEMS. Three tests with different rates are used to assess the reliability of the K estimates. The first injection rate is typically based on the expected K value in the test interval (e.g., 800 mL/min for sands). Depending on the magnitude of the pressure response in the first test, the second injection rate can be set higher or lower than the first (if pressure response is high in the first test, the flow rate in the second test is reduced, and vice versa). The third flow rate is set similar to that in the first test to check whether a similar pressure response can be obtained. The K values computed using Darcy’s Law were 66.0, 63.1 and 65.4 m/d, respectively, for the three tests in Figure 7B. A set of consistent K estimates is the goal; a lack of consistency could indicate DPP system instability or formation alteration. Figure 8 shows the comparison of DPP K estimates with those obtained from DP multilevel slug tests at GEMS. The results from DPP profiling have proven extremely useful for transforming collocated DPIL profiles into K estimates. The most significant advantage of the DPP is that, unlike all other hydraulic tests discussed here, screen clogging and near-rod compaction have a very small impact on K estimates. The insensitivity to the zone of compaction is a result of head-equalizing cross-flow between the thin compacted zone and the surrounding formation. The limited lateral sensitivity of the DPP (less than 0.5 m from the probe) is also one of its primary advantages, as it allows the tool to provide high-resolution profiles of vertical K variations in the immediate vicinity of the probe. Laboratory permeameter tests of sediment or core samples collected during drilling are also used for acquiring information about formation K. Different hydraulic systems can be used, depending on the expected K value of the sample. 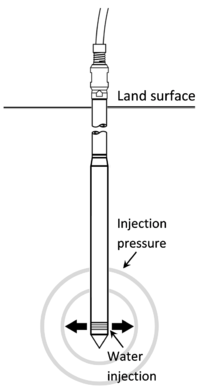 In general, when the sample K is high, constant heads are used for both the influent and effluent tubes to maintain a constant hydraulic gradient across the sample; however when K is low, falling heads are used for the influent tube with either constant or rising heads in the effluent tube. By measuring both the hydraulic gradient and flow rate, Darcy’s Law can be used to calculate the sample K. In laboratory permeameter tests, considerable care must be given to all stages of the work, including sample preparation and installation into the test cell, use of appropriate ambient stress for materials with high swell potential, de-airing of the hydraulic system and sample, mobilization and resettling of fine materials, head losses in the tubes, non-Darcian flow, and biochemical reactions due to changes in temperature and pore water composition. As discussed earlier, the question of how representative of field conditions samples are should always be considered when assessing the K estimates from laboratory analyses. Larger-scale preferential flow features, such as macropores and fractures, are usually not captured adequately by the samples, so K estimates from laboratory permeameter tests should be considered as the lower end of the range for field values. Field-based characterization methods of K are preferred over laboratory-based methods in most environmental site investigations. Estimates for formation K can also be inferred from the measurement of more readily evaluated geophysical properties using empirical, often site-specific, relationships. The geophysical properties that may be used for K estimation include, but are not limited to, electrical conductivity (EC) (or the reverse, electrical resistivity), the hydrogen response to nuclear magnetic resonance (NMR), and natural gamma radiation. In addition to K estimation, geophysical methods have also been used for many purposes in environmental site investigation, assessment and monitoring (see related article –Geophysical Methods). Borehole EC logging measures vertical variations in the bulk EC of the surrounding formation, which can then be used to estimate K based on empirical relationships. EC has been adapted to DP equipment for more efficient assessment of subsurface conditions than the approaches that rely on existing wells. Variations in the EC of saturated media are primarily a function of pore-fluid chemistry, clay content, and total porosity. If variations in pore-fluid chemistry can be neglected, EC profiling can be used to delineate the major hydrostratigraphic features, and thus large-scale variations in K. However, when electrically-conductive clay is absent, EC profiling generally provides little information about vertical variations in K in silts, sands and gravels. Borehole natural gamma logging provides a record of natural gamma radiation versus depth. This radiation is quantified by counting the gamma particles passing through a scintillation crystal in a certain time interval. A high natural gamma reading is generally associated with clay-rich intervals, while a low reading is generally associated with sands and gravels. Like EC logging, natural gamma logging provides an effective measurement of formation characteristics when clay is present, but is of less use in silts, sands and gravels. Figure 9B. NMR Responses as a Function of Pore Size, Where A is the Initial Magnetization, T2 is NMR Relaxation Time. Efforts have been made to adapt nuclear magnetic resonance (NMR) profiling, a widely used borehole technique in the petroleum industry, to environmental site investigations . This approach involves measuring the response of hydrogen atoms (protons) to a series of imposed magnetic fields at radio frequency. 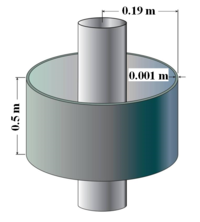 The response is a function of, among other things, the pore-size distribution of material in a thin cylindrical ring centered on the probe (Figs. 9A and 9B). K is then estimated from the pore-size distribution information using different empirical relationships, all of which have their origins in the Kozeny-Carman equation. Figure 9C compares the NMR results with DPP K estimates at GEMS. Figure 9C. Comparison of NMR and DPP K estimates at two GEMS locations. The dash lines show the range of the NMR K estimates due to the uncertainty in the empirical parameters used in the pore size - K relationship. The NMR logging tools used in the petroleum industry are typically too large for use by the hydrological community (e.g., tools are typically well over 10 ft long and have a diameter larger than 5 inches). The equipment costs are also prohibitively high for hydrological users. After recent technology advancements, NMR measurement can be made much more effectively both at the surface and in a borehole, including with DP equipment. The equipment costs are significantly decreased compared to those used in the petroleum industry. The measurement time is reduced down to a few minutes per interval. The vertical sampling interval of most current logging tools is about 0.5 m. Different tool diameters are available, with the smallest being deployable in a 2-inch well. Due to these improvements, NMR has been increasingly used by environmental site investigators worldwide. Cone Penetrometer (CPT) profiling is one of the most common approaches for quantifying the mechanical properties of unconsolidated sediments by geotechnical engineers. CPT profiling measures the mechanical resistance on the tip of a conical probe and on a sleeve immediately behind the tip as the probe is advanced into the subsurface. These measurements are often supplemented by pore water pressure measured behind the cone tip due to its impact on mechanical responses to advancement. These quantities are used to determine the sediment class of the material, from which K can be estimated using empirical relationships. The resulting values, however, only provide order of magnitude estimates of formation K .
CPT profiling can be periodically suspended to perform pore pressure dissipation tests to obtain information about the consolidation properties of the formation at selected depths. Hydraulic conductivity can be estimated from these dissipation tests using relationships between K and the consolidation properties of the formation. Generally speaking, the K estimates from dissipation tests tend to be more reliable than those from continuous logging. Robertson (2009) suggests that it is possible to combine continuous profiles and dissipation tests to improve the quality of CPT K estimates. There are a few practical challenges with CPT profiling. First, it is difficult to keep the porous element for pore pressure measurement fully saturated while the probe is driven through the vadose zone. Clogging of the porous element may also be a concern at sites with a significant amount of fine materials. 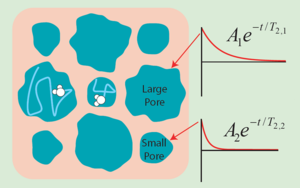 Similar to DPIL, formation alteration can produce a significant impact on the pore pressure. However, unlike the HPT where the pressure port is located farther away from the tip, the porous element is immediately behind the tip so that the impact of probe advancement on the CPT pore pressure measurement will be much greater than with the HPT. C is an empirically-defined coefficient dependent on grain size and sorting. The value of C varies with the units for K, and has a large range of published values reported by different researchers. dm is the geometric mean grain size in mm, calculated as (d84 X d16)0.5. The K estimates from Kozeny-Carman approaches are generally considered to be more accurate than those from the Hazen equation, although both approaches have a number of significant limitations in practice. Due to the large uncertainty associated with core sample representativeness, field-based approaches are preferred for acquiring information about K in environmental site investigations. Under certain conditions, such as sites that are primarily composed of low-K silts and clays, hydraulic testing may be time consuming so that only a limited number of measurements can be obtained in the field. In this case, coring and subsequent laboratory analyses can be used as a complement to increase the spatial coverage of K measurements across the site. For field-based approaches, hydraulic tests provide more reliable K estimates than indirect approaches such as geophysical methods. However, geophysical methods are generally more time efficient and can provide more information about the spatial continuity of subsurface flow and transport features. There is a growing interest in the joint use of hydraulic tests and geophysical methods, so that high-resolution characterization of K can be obtained across the entirety of a site, rather than just in the immediate vicinity of the limited number of boreholes. Pumping tests provide K estimates averaged over a large volume of formation and do not provide information at the scale relevant to solute transport, so they are not recommended in environmental site investigations directed at getting information about spatial variations in K. Slug tests can be used to obtain high-quality K estimates at the relevant scale, but considerable care must be exercised in all stages of the work, including the proper development of the measurement interval prior to the tests. Borehole flowmeter profiling is sensitive to in-well hydraulics and generally does not provide high-quality K estimates in less permeable settings. DP methods have great promise for measurement of spatial variations in K in shallow unconsolidated formations. Because the tools are small in diameter and no materials are removed during advancement, DP methods generate much less site disturbance than traditional borehole techniques (e.g., rotary drilling). Two of the most promising DP K methods are DP injection logging and the DP permeameter. DP injection logging is quick and high resolution, but is considered to only provide relative information on K because factors other than K can also affect the pressure response. The DPP provides reliable K estimates and is more time efficient than other formal hydraulic test methods. The most significant advantage of DPP is that a low-K zone formed by advancement-induced compaction has little impact on the estimated K due to head-equalizing cross-flow between the thin compacted zone and the surrounding formation. A variety of methods are available for characterizing K in environmental site investigations. Historically, pumping tests and slug tests have been the most common methods for in situ measurement of K. Recently, two direct push (DP) approaches have become more common for measuring spatial variations in K in shallow unconsolidated settings: DP injection logging and the DP permeameter. DP injection logging is quick and high resolution, while the DPP provides more reliable K estimates that are not significantly impacted by a compacted zone around the probe. ^ Dagan, G. and Neuman, S.P. eds., 1997. 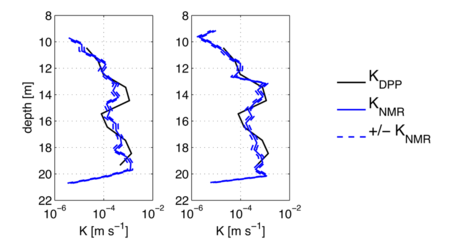 Subsurface flow and transport: a stochastic approach. Cambridge University Press. ^ Fogg, G.E., Carle, S.F. and Green, C., 2000. Connected-network paradigm for the alluvial aquifer system. Special Papers-Geological Society of America, pp.25-42. ^ 7.0 7.1 7.2 Freeze, R.A., Cherry, J.A., 1979. Groundwater. Prentice-Hall. Inc., Englewood Cliffs, NJ ISBN 0-13-365312-9. ^ Batu, V., 1998. Aquifer hydraulics: a comprehensive guide to hydrogeologic data analysis. John Wiley & Sons. ^ 18.0 18.1 18.2 Duffield, G.M., 2007. AQTESOLV for Windows Version 4.5 User's Guide. HydroSOLVE, Reston, VA.
^ 20.0 20.1 20.2 20.3 20.4 20.5 Butler Jr, J.J., 1997. The design, performance, and analysis of slug tests. CRC Press. ^ Dietrich, P. and Leven, C., 2009. Direct push-technologies. In Groundwater geophysics (pp. 347-366). Springer, Berlin, Heidelberg. ^ 38.0 38.1 McCall, W. and Christy, T.M., 2010. Development of a hydraulic conductivity estimate for the Hydraulic Profiling Tool (HPT). In The 2010 North American Environmental Field Conference & Exposition: Conference Program with Abstracts: Session VII. ^ Christy, C.D., Christy, T.M. and Wittig, V., 1994, May. A percussion probing tool for the direct sensing of soil conductivity. In Proceedings of the 8th National Outdoor Action Conference (Vol. 38, pp. 1-394). Dublin, Ohio: National Ground Water Association. ^ Lunne, T., Robertson, P.K. and Powell, J.J.M., 1997. Cone penetration testing. Geotechnical Practice. Spon Press/Taylor & Francis Group, London and New York.